When choosing furniture for your home, learning more about the construction of the material used is one important way to assess the quality of the product. This page will give you an in-depth look at what materials we use for our murphy bed construction, as well as an understanding of why we chose them and how they compare against others in the industry. 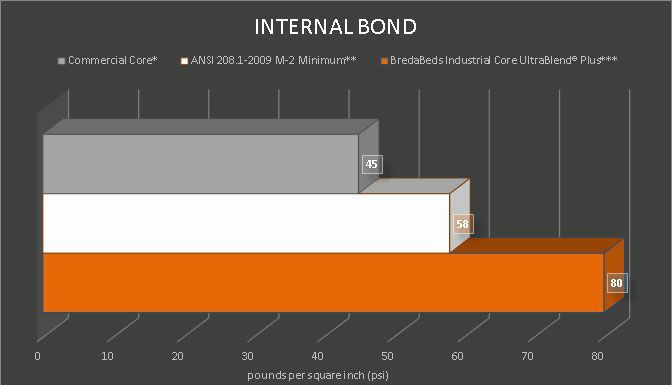 In the graphs below, Commercial Core* is represented in GRAY, ANSI 208.1-2009 M-2 Minimum** is represented in WHITE and BredaBeds Industrial Core UltraBlend® Plus*** is represented in ORANGE. When we began designing our product lines, we looked for materials that would be durable enough to be transported around the country, assembled without hassle and still look excellent, without any defects. We feel this search has led us to the perfect combination of materials. 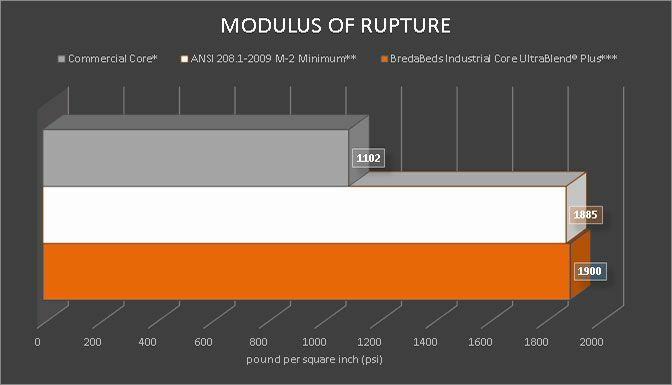 Our wall bed construction starts with 3/4" thick industrial core particle board, faced with a moisture-proof thermally fused melamine coating, to provide a durable hard surface. On some of our products and panels, we use Medium Density Fiberboard (MDF) bonded with vinyl film, known as Rigid Thermofoil (RTF), or sometimes known as 3D Laminate. Both materials are a multi-layered composite, made in the U.S.A. from 100% recycled or recovered fiber. For panel connections, we use “cam fittings” that have a zinc alloy tightening element that use the centric sphere principle. This allows for parts to self-align to each other and fit tight while holding everything together securely. Many of us are already familiar with particle board. Unfortunately, this familiarity is with the thin, cheaply-made T.V. stands and other furniture, commonly found in discount stores. Although it shares a common name, this however, is nothing like the material we use. 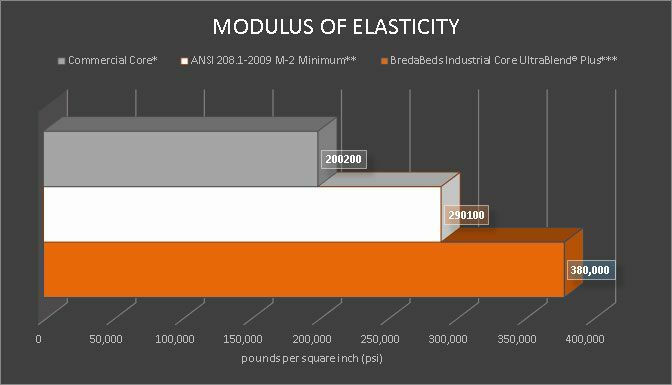 Our 3/4" thick industrial core is far superior than the commercial core (or sub-commercial core) commonly found in discount stores. You may find that other manufacturers try to market to this myth, but this is due to a misunderstanding that all particle board is created equally, which it’s not. It comes in a variety of densities (such as low, medium and high), it comes with different types of glues and resins, with different surfaces, particle size and thicknesses. To help address this huge variety, the American National Standards Institute (ANSI) has created a classification of the various types which is known as ANSI 208.1-2009. 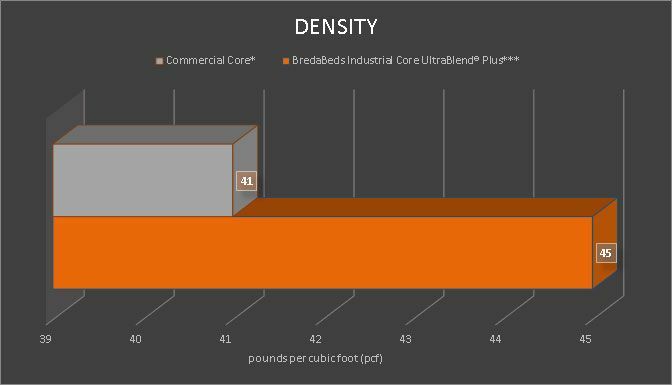 By these standards, the industrial core we use is classified as M-2, which has a density of 45 pounds. This particle board is much, much stronger than what most people first think of. Melamine and 3D Laminate is abrasion and scratch resistant to maintain a “like new” appearance. The surface can easily be cleaned with soap and water making it easy to care for. The color will not fade or alter to sunlight exposure. NAUF (No added urea formaldehyde) - meets the regulation (24 CFR 3280.308) when tested in accordance with ASTM E 1333 for low formaldehyde emissions as required by HUD for use in manufactured housing. We spend quite a lot of time to carefully research materials before we use them in our products. In this article we've shared some of this information with you and hope this can help you be a more informed buyer. Click on the images to the right to see a larger view of the data graphs and download the PDF files below under 'References' to learn even more. We would like to hear back from you, feel free to give us feedback in the comments below.